This offbeat novel first published in 1973 begins with the dread Emperor of the East enjoying the slow impalement of one of his people. He then meets with his various chiefs and magicians to discuss the threat posed to their empire by Ardneh, some strange being that seemed in league with the West. 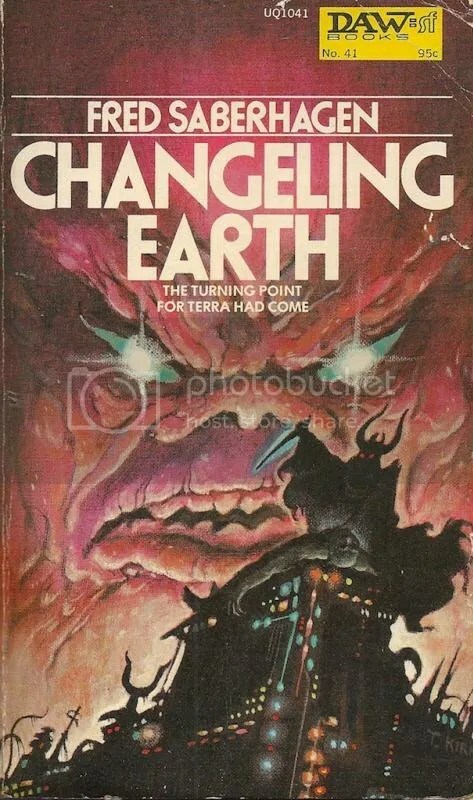 The novel appears at first to be heading down the same path as Roger Zelazny’s Jack of Shadows, with an evil wizard anti-hero doing his thing in a magic-filled world where science does not work. Instead, chapter closes with the emperor being struck down in some sort of trick by Ardneh. The perspective then changes for several chapters and we get a glimpse of the wider world from the perspective of the West. Their magicians depend on elementals for their magical effects. They dominate the night with their army of owl-like birds. The East depends on demons for their spells and their armies tend to dominate during the day thanks to their flying lizard minions. Most people are reduced to wielding swords in battles, but most groups of fighting men will usually have a mage attached to their unit. But the entrance of Ardneh into the conflict is starting to turn the tide against the East. This strange spirit comes to all manner of people in the West, prompting them to be at the right place at the right time and giving them clues for how to best take advantage of openings that the East leaves for them. It’s hard to tell if this is necessarily a good thing– no one knows who Ardneh is or where he came from or what his ultimate aims are. If anyone is skeptical of his directives, the still small voice that is Ardneh merely replies, “by their fruits you shall know them.” He’s given the people of the West sound information time and time again… isn’t that reason enough to trust him? “I was built by war-planning men of the Old World, as part of a system of defense, but not as a destructive device of any kind. My oldest purpose is to defend mankind, and so I am of the West today, though there was no East or West when I was built. But my basic nature is one of peace, so it has taken me long to develop weapons of my own to enter battle. The object you have brought me will be helpful there, adding to the physical strength I can exert, if the test I am now conducting has a favorable result. More of that later. “I have spoken of my builders. They meant their defense system to save the world, and in a sense they did. But they called on powers they did not fully understand and could no wholly control, and in saving the world they changed it, so drastically that their civilization could not survive. This was the great Change of which men still speak, dividing the Old World from the New. “As I will show you soon, the world was changed by another machine, or rather by a part of me that is a part of me no longer, having done its work and been dismantled. I, the part of me that still exists, was created to end the Change when the time was ripe. The builders did not really expect that the changes in the world wrought by their defenses would be so great that I would be needed, but they doubted and feared enough to make me and to put the powers of restoration under my control if and when they should be needed. They never dreamed, I suppose, that fifty thousand years must pass before the proper time for restoration came. But only now has it come. The odds for the survival of mankind, if the restoration is accomplished in this year, in this month, are better than they have been at any time since the Change, or are likely to be in the estimable future. Now disaster was only seconds away from most of the major cities of the land. The part of Ardneh that had been built to change the world was empowered to act, and functioned as it had been made to do. It laid hold upon the matter within itself and pulled its energies into a new shape, beginning a Change that spread through the substance of the earth like cracks through shattering glass. A round wave-front of Change sprang out with the speed of light from Ardneh’s buried site. But the setting in motion of the ultimate defense had taken a few seconds longer than anticipated. One enemy missile fell just before the wave-front reached it and exploded with full force beside a populous city, ending uncountable lives in the blinking of an eye. Other intercontinental weapons, falling like hail a few seconds later failed to explode. Meanwhile, on the other side of the world, surprise; the enemy was employing the same kind of an ultimate defense. Theirs was not, however, controlled by any device as sophisticated as Ardneh, and their simpler mechanisms were never to become alive. This too Rolf understood as in a dream, knowing it was so without knowing how he knew. But the enemy defenses also worked. A wave of Change springing from the other side of the world met that generated by Ardneh, and the fabric of the planet was altered more powerfully than anyone had thought it would be. Those few missiles that fell before the Change exploded, and the vast number that fell afterward were rendered practically harmless. One missile, however, to which Rolf’s attention was now silently directed, was caught precisely in mid-explosion by the wavefront emanating from Ardneh. The fireball, the blooming nuclear blast, had just been born and it was not extinguished but neither did it follow the normal course of the explosions that had preceded it. It did not fade, but changed in shape, ran through a spectrum of colors and back again, and writhed up toward the sky as if with agonizing effort. Rolf knew that he was watching a kind of birth, and one of terrible importance. So this magic filled post-apocalyptic world is a result of two nuclear damper technologies having unanticipated side effects in the midst of a classic cold war nuclear exchange. The unique thing about this is that unmitigated destruction is the means of injecting powers and principalities into the overarching premise. Ardneh is an artificial intelligence entity empowered to alter the laws of nature in order to protect mankind from total destruction. He functions as a sort of guardian angel for the West. In opposition to him is the demonic force of Orcus, the result of an ill-timed nuclear explosion. The magicians of the East attempt to harness this demon for their own ends, but find that he is not entirely under their control. As you can see, political situation of the default Gamma World campaign setting is a big contrast to the thinly veiled cold war era superpowers setup we see in Changeling Earth. It’s more of a complete zoo, an insane mutated wilderness with enclaves of off the wall secret societies occasionally exerting greater influence within relatively small locales marked out on the area map. Outside of these relatively limited areas, agents from any of the Cryptic Alliances can be found, but it’s more likely that random encounters will involve wild mutant creatures, robots, or independent humanoid tribes. Looking back, it’s not hard to imagine why oddball groups like this would have failed to get much play back in the day. In the first place, the mutations and high tech weapons are so much fun, few gamers are didn’t care about much in the game besides looting the next installation. Secondly… information on Cryptic Alliances was pretty sparse in the third edition rule set. People who came to the setting with that particular iteration would have had so little to go on that they would more than likely drop the parts that weren’t immediately playable. But combining this particular nugget with what we see in this Fred Saberhagen novel could lead to some interesting gaming situations. The Followers of the Voice don’t have to be the superstitious simpletons that mindlessly venerate Ancient computer devices. There might really be a voice coordinating disparate groups across the post-apocalyptic wasteland. Perhaps the power that is directing them gets more intelligent and threatening as they obtain the necessary parts to bring its primary installation up to a more effective working order? If the voice represented an intellect from before the apocalypse, it would be able to direct adventuring groups to potentially unspoiled caches of materiel. It may even be able to help them find a means of entering ancient military complexes and disabling its defenses once they are inside. The way that the overall intent of how these Cryptic Alliances were meant to be used seems to shift over time is most clearly evident with this particular group. With first edition, they are mainly background for encounters with non-player characters. By third edition, there are elaborate rules governing how players could join them and gain status within them. (Oddly enough, it is implied that the players’ party could even be comprised of individuals from different groups.) However, the series of adventure modules released for that iteration of the game were designed under the assumption that the Restorationists were basically the “good guy” group and that the players would be working for them by default. Going back to the original material and giving it a Changeling Earth style twist, I would look at making it possible for the Restorationists to genuinely threaten to turn back the clock. Science and technology still work in the Gamma World setting, of course. And yet… the sort of fastidious scientific realism that was endemic in eighties games is conspicuously absent. What if there were are reason for that? What if the oddities of the artifact operation charts were the result of changes to the laws of physics that occurred during the apocalypse at the close of the Shadow Years? Similarly, there is no magic in the Gamma World setting. But what if the game’s mutation system was made possible by a fundamental shift in the nature of reality? Perhaps the Restorationists are privy to information that would allow them to change things back. If they have their way, the laws of physics would be restored, mutations would cease to function and technological artifacts would go back to being more consistently comprehensible. But what would the side effects be? Will mutant creatures simply die when the new change occurs? Will artificial intelligences that have transformed into strange spirit-like forces revert to mere computer code that can’t even pass a Turing test? Do average Restorationist operatives even know what would happen? Or does an inner circle of elders carefully guard the true nature of their work from discovery? Most importantly… how will the players respond to all this once they catch wind of what this Crytpic Alliance is really up to? Personally, I can’t imagine them wanting Gamma World to ever change on such a fundamental level. It’s just one of the most unaccountably fun settings ever developed for a role playing game. The prospect of the game actually turning into a really mediocre version of Twilight 2000 would more than likely end the campaign. Still, “the last Gamma World adventure” could make for some truly memorable action. Whether the indefatigable band of mutated misfits fails to prevent the restoration of the old world, or whether they allow it to transpire as a sort of least bad alternative to something much worse, it could be something that players end up talking about for a long time. ² See pages 57-58 and 112 in the AD&D Dungeon Masters Guide for details. My favorite book by Saberhagen. An excellent point about it seeming to apply more to Gamma World. Still, the “default” setting of a D&D world tends to be after some type of apocalypse has collapsed the earlier more advanced world. This novel may have had a more subdued influence on D&D, though. After all Gygax included crashed spaceships and robots in Greyhawk, and Arneson had robots and power armor in Blackmoor. And a few D&D artifacts could quite easily be high-tech survivors. Rick Stump (of Don’t Split the Party) was explaining that to me this morning. I really need to track down a copy of the original Greyhawk and Blackmoor booklets. (I’ve never even seen them, actually.) Hill Cantons makes a pretty solid case that the implied setting of AD&D is itself post-apocalyptic. I had no idea…! Expedition to the Barrier Peaks was a total shock to me as a player, because every adventure I’d played or DM’d to that point had been full of relatively “conventional” D&D tropes. The module cover gave no hint of the Saberhagenesque surprises to come. Unfortunately, the module itself didn’t set up well on the mystery side: I think it took about 15 minutes of play to figure out what was going on, and that was before the DM started dutifully showing us exact pictures of the weird magical stuff the party was finding. Still, it was a cool idea, fun to play, even if it was not ideal in execution. I hear that a lot of people playing Metamorphosis Alpha had no idea they were on a spaceship for a long time… then they come across this odd hatch and end up seeing what’s really going on from the portholes on the other side…. Heh. Wasn’t there a whole series of books in this line? This is actually the third book in a trilogy. The remark about D&D having originally been intended as a multiverse reminds me of The Fantasy Trip’s setting of Cidri. A world with more than 50 known continents and even that was a small fraction of Cidri. It was purposely set up so that every adventure run with TFT could be in the same “setting” as it were. One of the great classic RPGs. The Fantasy Trip is one of my favorites. When I first came across Cidri I thought it sounded crazy… just completely wild. I see now that it thoroughly consistent with the science fantasy the first rpg designers would have been familiar with. Ah, yes. 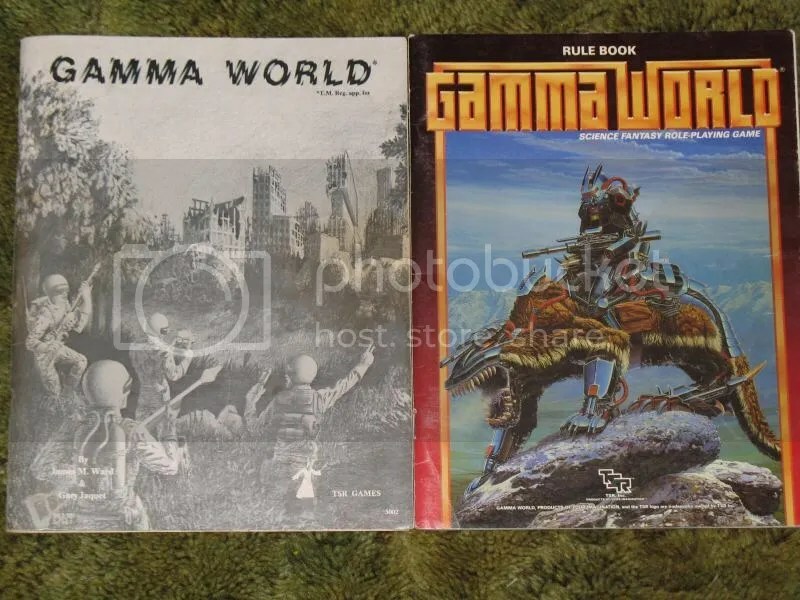 Gamma World. Personally, I preferred FGU’s Aftermath in the post-apocalyptic genre. It was much more real life oriented (despite the fact that the .25 ACP had a NEGATIVE damage rating!). Ah, I had to look this up since I remembered Ardneh from “Empire of the East” which I guess is the omnibus edition of the trilogy. First book with a post-apocalyptic flavor that I read in a well-spent youth – well spent reading. I much preferred his Books of Lost Swords and Books of Swords, though.